A short post today, following the theme of some other recent posts. 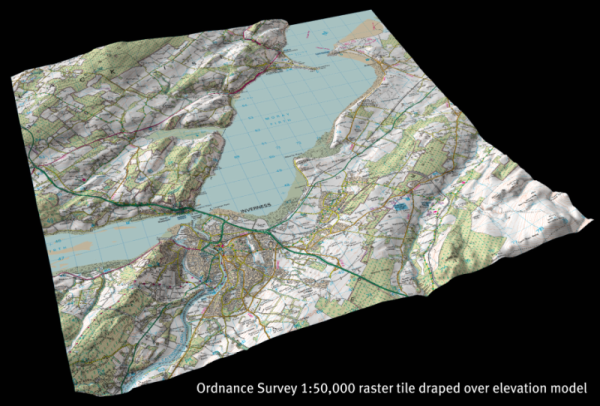 I've been experimenting with creating different kinds of 3D surfaces with Ordnance Survey data. I've also been experimenting with ways of displaying these online. So, what's a 'lightbox' - well, it's a way of making an image pop-out on screen with the background darkened. Click the image below to see this in action. The 3D map in the lightbox is just a surface model I created using an OS 1:50,000 colour raster tile for the Inverness/Moray Firth area in the north of Scotland. Further details of how to integrate lightboxes into blogger (for nerds) can be found here. I've not been saying much recently about screencasting, or video tutorials, but I have been working in this area quite a lot over the past year - mainly in conjunction with SalfordGIS. I've just come back from the Planning Research UK Conference in Chelmsford where I was speaking about my work in this area. So, I thought it was about time for another GIS screencast post. The video below is one of a series I've produced in collaboration with SalfordGIS. This one is a basic ArcMap demo but we also have lots of MapInfo videos too. For both GIS applications skills from basic to advanced are covered. The videos are all around 3 to 5 minutes long each, with one task demonstrated per video. The idea is not to replace traditional GIS training but to provide quick refreshers of key skills. A short post today on visualizing commuting flows. I've used some 3D GIS techniques to create a commuting surface for the North West of England (based on wards). Areas with peaks represent high in-commuting. 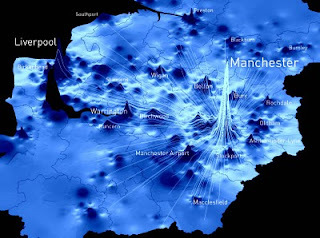 Manchester dominates the North West pattern, as seen below. This is only really a rough draft, but it does communicate quite a bit of information and it tells a familiar story of urban commuting. Click on the map to see it in full size. OS OpenData - It's Here!